Enhance your games of Elder Sign with these four 3D printed stands for your Investigator tokens. Forget moving the fiddly tokens and easily move your Investigator around the museum. The stands features space for your Investigator and a home for focusing a die while completing tasks. Choice of colours black or silver. The stands will come supplied in a reusable plastic zip bag. 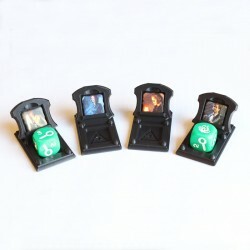 This listing is for the stands only and does not include the dice etc in the photos.